Born 1871 in Germany, John Sedler immigrated and became a naturalized U.S. citizen in 1896. He purchased this property in 1910 and was a merchant, owner of Owl Drug store (and salon depending on era). 1912 advertisements for the store in the Arizona Republican bragged “free motorcycle delivery.” A map by O.A. Turney of Phoenix shows “Sedler’s Addition” bounded by 12th to 13th Street and Roosevelt to Diamond Streets. 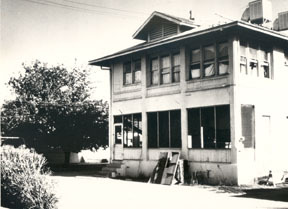 Built in 1912, John Sedler’s house was set on 5 acres and looking out on alfalfa fields to the south of Roosevelt Street. “We stuck out like a sore thumb” said John Sedler’s daughter, “no sidewalks, nothing.” The house occupies the northeast corner of 12th Street & Roosevelt. Architecturally and historically it is significant by its age and massive proud manor. 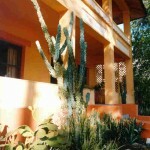 The house draws directly from the “Bungalow Style” while using detailing more common to Colonial or Mission, blending into a Territorial vernacular developed in this region. This blend of styles and its exceptional size relative to the “Bungalow Style” (typically one story) makes the building architecturally significant. The house originally used a solar hot water system on the roof . 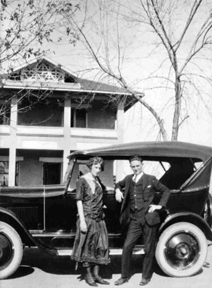 The Sedler’s resided there until 1948, when Earl Brown and his family made it their home. 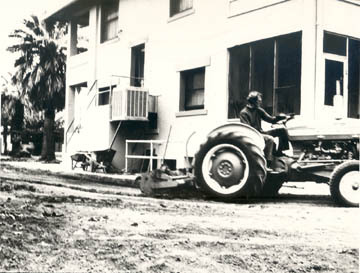 In 1971, Alwun House founders purchased the dilapidated property and began their rehab & retrofit efforts. The Sedler House, aka Alwun House was placed on the Arizona State Historic Preservation Office’s Inventory of Historic Properties, on May 11, 1993; making the house eligible for National Historic Registration, On Feburary 9, 2005 the City of Phoenix placed the Sedler House on it’s list of registered historic properties for it’s individual significance. Founder Kim Moody had a vision to create one place where artists of all media, come together to explore and refine new works. By serendipitous opportunity in 1971, they acquired the historic Sedler House in partnership with Laurence Vanderbeek, a perfect homestead to grow this vision. The first Alwun House event was of course a “Ground Breaker.” Unveiling cutting edge multi-media theatre plans, they set precedent for surprising their audiences, everyone was invited to help haul out buckets of dirt as construction began. For the first 10 years Alwun renovated the house facility and landscaped gardens, creating lush treed overgrowth with koi ponds, and small stage. These efforts resulted in Alwun’s first award, “Environmental Quality Improvement” awarded by Mayor Margaret Hance. (Mayoral “Alwun House Day” Proclamation lists other “Firsts”). Alwun House grew as the first nonprofit alternative|contemporary art gallery in downtown. The central floor became an art gallery, the basement produced multi-media theatre producing such notable productions as “Games I’ve Played While Waiting for the Messiah.” A more practical “Food for Thought,” demonstrated the benefits of growing your own food, with the cyclic slogan; “dig it, plant it, grow it, eat it.” Alwun hosted luminaries like Marcel Marceau and Mummenschanz, Baba Don Gong meditations, Latin Peñas with Alberto Rios, first “Performance Art” to be seen in Phoenix and other eclectic events. A popular series of the seventies was “Heartsong,” a heartfelt music and poetry reading series. During the second decade, multiple cultural productions grabbed media attention; none more than Caribbean Carnival’s festival of ethnic music, dance, costume and food. Alwun House was first to showcase reggae with emerging world beat music at its original “Caribbean Carnival” productions. Birthed at the House, crowds quickly overwhelmed the space mandating larger more innovative locations. Carnival 5 opened seven stories up on top of Valley National Bank’s parking garage, a rousing success. Now a city co-sponsored festival, Mayor Terry Goddard stated “I can feel the heartbeat of the City.” Increasing in scale they culminated with 17,000 attending Wesley Bolin Plaza. With regulatory expenses grew exponentially, and on one rainy night, Alwun lost it’s shirt (and the house). Even in then, during this transitional period, Alwun House steadfastly showcased local contemporary artists adding new exhibits annually. Now approaching an expanding 40th Season, Alwun’s labeled with titles such as; “legendary,” “institution.” Downtown’s first art gallery, that grew to shape the Arts District Overlay, has been identified as a cultural node in the area, and a long standing community asset. Alwun Staff and volunteers look forward to the growth this new millennium promises as the one place where artists of all media, come together to explore and refine new works in Phoenix. Drove by the other day and was impressed that the spirit had survived. I moved from Michigan in 1977 and lived at 1122 E. Portland St. for two years. Truly impressive 34 years later to see the house still standing. The house always reminded me of Ann Arbor, MI. Unfortunately in our money grubbing society the neighborhood looks much the same as it did in 1977. It was nice to see that some people can keep their ideals apart from the avarice that has permeated the rest of our society. 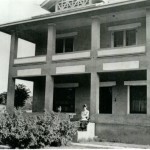 The Alwun House has always been the spotlight of the neighborhood. Early in my adult years I spent time there, exploring my artistic side. I remember the first Caribbean Carnival well, and the spirit that Kim and Larry brought to the neighborhood, their dedication to locat artists and venues will always remain a hightlight for me. The time and energy that birthed The Alwun House has been pure inspiration ! I am excited to see it is moving forward from the plan and ideals it was constructed on. The Alwun House holds memories for me. In 1983 my husband & I lived next door and got to know the man that was running the house at the time. He had several summer concerts that we were invited to attend for free. We rented the house in July of 83 for our wedding. It was held in the backyard under a parachute that was hung for shade. I love the Alwun House. Started going there in the early 90′s. Fell in love immediately, painted some of the Koi pond fish. I think my goal as an artist, is to one day see one of my paintings hanging in my most favorite art space-Alwun House! In the last few years, started hitting their Halloween party! What a blast! Again, I just love this place! It was delightful to perform my poetry last weekend to honor Earth Day – Rebirth – Fusion Foundation co/hosted Celebration 4/14 – Alwun is a delightful venue – amazing energy for arts in Phoenix – Thank you! Have known Kim (&Chuck! :-( RIP) since late 70′s, myself, Mary McCann, Linda Cushma, Dave Cook (11 East Ashland Gallery, myself, Dana, Jeff Falk, Bart Nagel, Kimber Lanning, Leslie Barton, Mary Ann Fernandez-Herding (The Movement Source Dance Co.) many, many others did all we could to make down town PHX, art, music, dance, communciation, poetry, slam’s, jam’s and much fun for years!!! AND it is still going thanks to Kim’s love & dedication and help from many others!!! AND THAT IS A DAMN GOOD THING!! Love 2 All, from Rick “The Modern Mailman-Mill Ave) & Zonal Rick Wall.